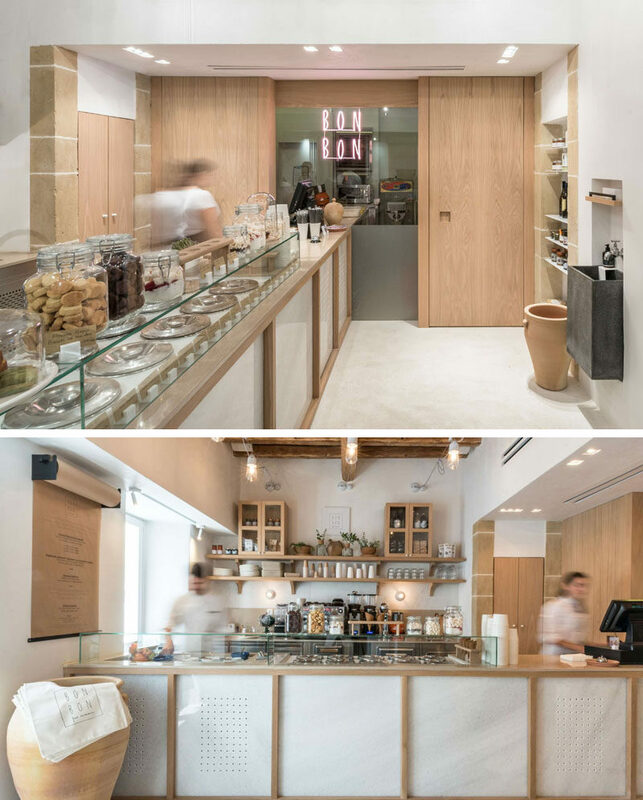 Interior Design Laboratorium have recently completed BON BON Fait Maison, a unique small ‘gourmet fast food’ cafe that’s located on the island of Kythira in Greece. 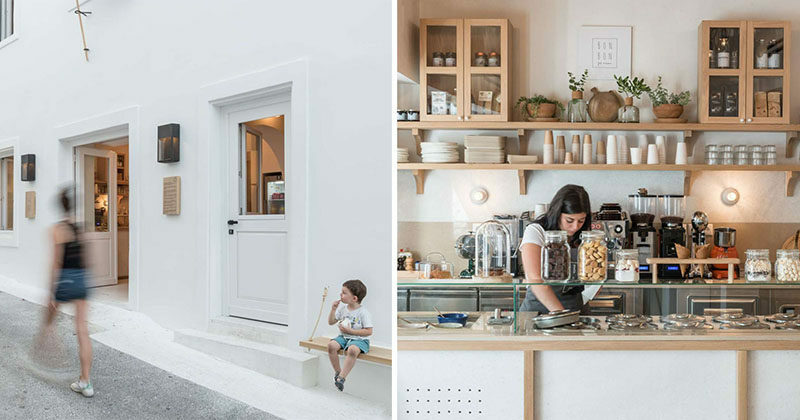 The white building, which dates back to the 1860s, was refurbished with the help of the local architectural firm m3kythira. 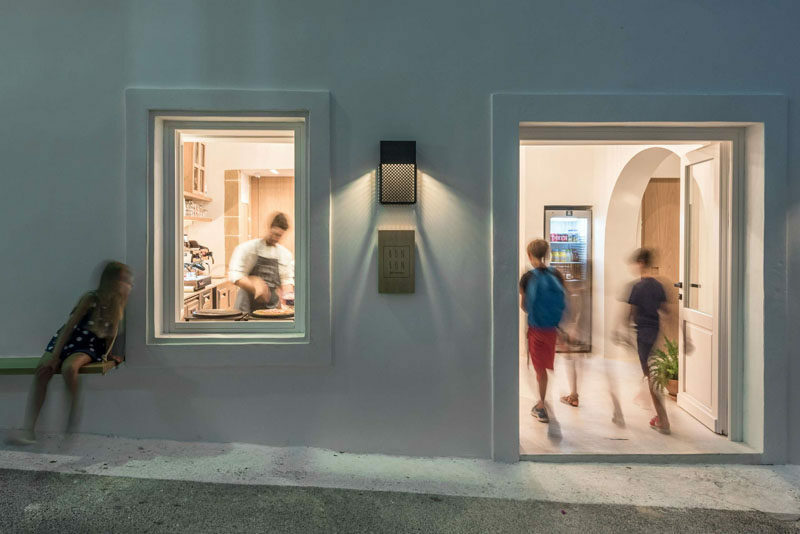 At night, a simple wall sconce highlights the name of the cafe, while a window provides a glimpse of the activities inside. The interior has been set up with a service counter that leads from the front door to the back wall. 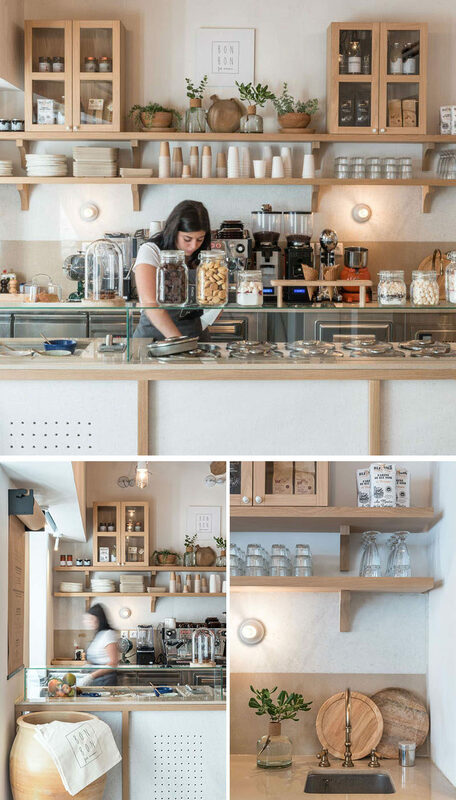 A wood and white color palette has been used throughout with simple wood shelves and cabinets providing storage for the variety of plates and cups. 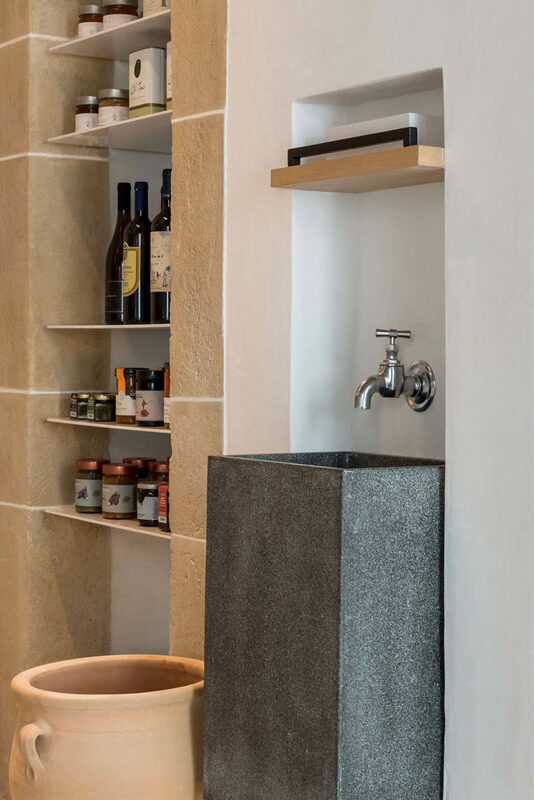 On the wall near the service counter, there’s built-in shelving with products for purchase and a tall grey sink with a single tap. 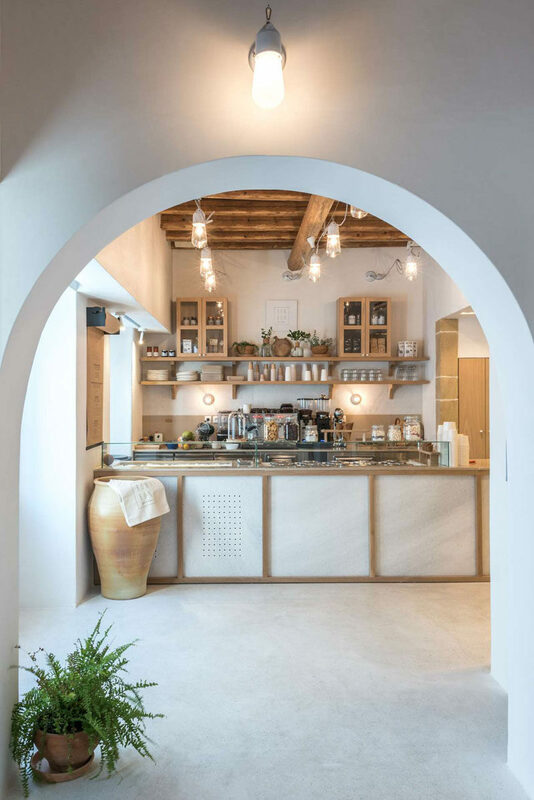 The careful selection of materials and elements, such as the traditional mosaic floor, the white marble from the island of Naxos, the built-in benches and the wooden ceiling which was carefully restored and preserved, are familiar images tied to Greek island houses. White plaster walls helps to keep the interior bright and airy, while a small sitting area with a built-in bench is located on the other side of an arch. 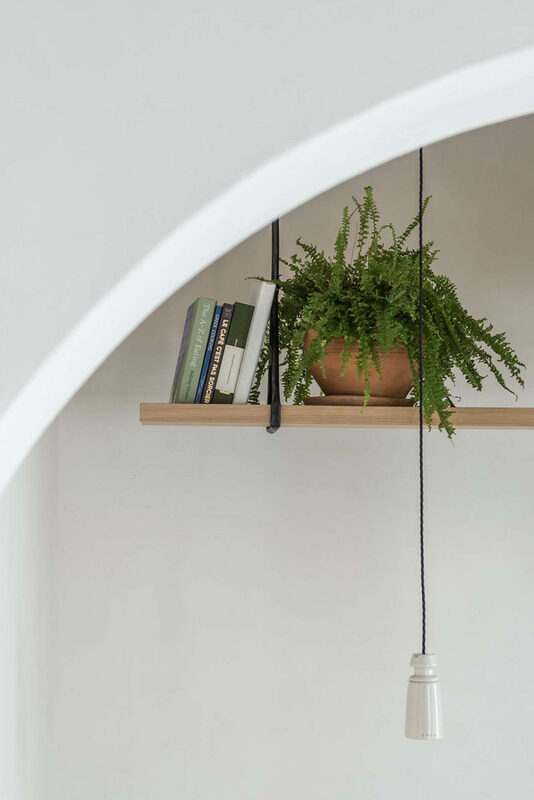 Hanging above the sitting area is a simple wood shelf that’s home to plants and books. Here’s a glimpse of some of the menu items that includes homemade ice creams and sorbets, and crepes.